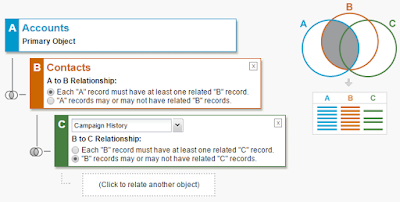 The 1st option require at least one child record, otherwise the parent record will not show in the report generated, while the 2nd option do not require any child record. You can easily change the relation from 1st to 2nd, or 2nd to 1st anytime. Now, let's take a look on simpler report type metadata which contain no object relationship - only Account for this sample, there is no <join> tag and no second <section> tag for related objects. When the first object relationship is "must have at least one related", you have both the same option for second object relationship. But, when the first object relationship is "may or may not have related record", you only have option "may or may not have related record" too for second object relationship. Let's take a look on the metadata, we have additional <join> tag within <join> tag, and additional <section> tag.